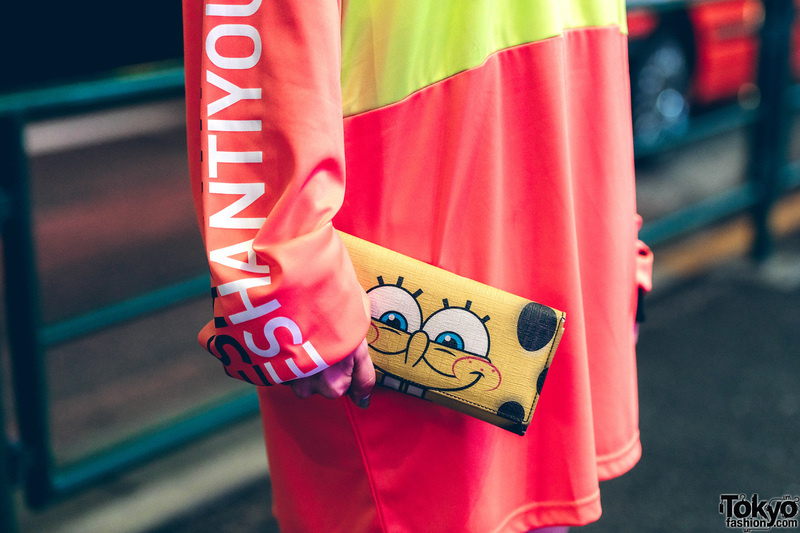 Here’s Chieri, whose bright orange-and-yellow ensemble caught our eye on the streets of Harajuku. Chieri wore an oversized orange graphic sweater from Fresh Anti Youth, which featured contrasting black trims and a yellow panel. She styled it with yellow-and-black printed knee-high socks worn with black platform wedge sandals. Chieri accessorized with hoop earrings, a beaded necklace, and oversized glasses. She finished off her look with a black beanie, red lips, and a SpongeBob SquarePants clutch. Follow Chieri on Instagram for more of her street style.